A Recipe from the Circle L's Chuckwagon. 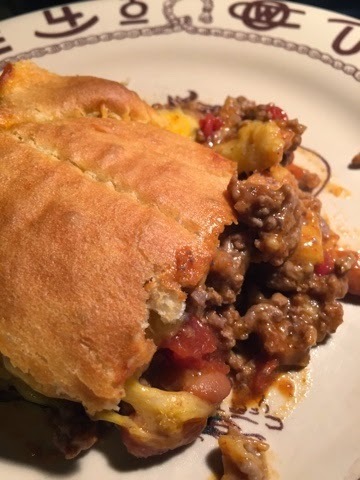 From The BlogA Sunday Thought The Blog Beef A Recipe from the Circle L’s Chuckwagon. A Recipe from the Circle L’s Chuckwagon. Circle L’s Taco Squares. I served it with a fresh lettuce salad. This week I thought I would share with you a Beef recipe that my family loves. It is very good. I also have been taking the #proteinchallenge and this dish fits right in with having protein. If you are interested in taking this challenge please visit: Protein Challenge. Never thaw meat on the counter. Always thaw meat in the refrigerator, microwave or cool water bath. Always wash cutting boards and plates after having been in contact with raw meat. Always cook to appropriate internal temperatures. Safe internal temperatures vary based on cut. Hamburger must reach a safe and savory 160o, while steak is safe at 140o. Circle L’s Recipe from our Chuckwagon. Add taco seasoning, pinto beans, diced tomatoes, and enchilada sauce. Stir well to combine and reduce heat to low. Simmer for 15- 20 minutes, stirring frequently. Preheat your oven to 425 degrees and spray a 13 x 9 pan with non-stick cooking spray. Press 1 can of the crescent roll dough into the prepared pan, pressing with your fingers to cover the bottom of the pan. Spoon the Taco Square mixture on top of the dough in pan and sprinkle evenly wit cheese. Carefully place the 2nd sheet of crescent roll dough on top of the cheese, lightly pressing the seams together and pulling the dough out to the edges of the pan. Brush the top of the dough with milk. Bake uncovered for 13 to 15 minutes till nicely golden brown. Serve immediately. I also double this recipe so that we can have leftovers. Our kids love it. I serve it with a lettuce salad and hot sauce.